Living well + beautifully + justly are all one thing. You’ve probably heard about Prime Minister Justin Trudeau and his clumsy elbows by now—because Canadians accidentally elbowing each other is apparently world news worthy. But in case you missed it: a couple of weeks ago, the House of Commons was preparing to vote on a controversial assisted-dying bill when a disruption sent the room into sudden chaos. 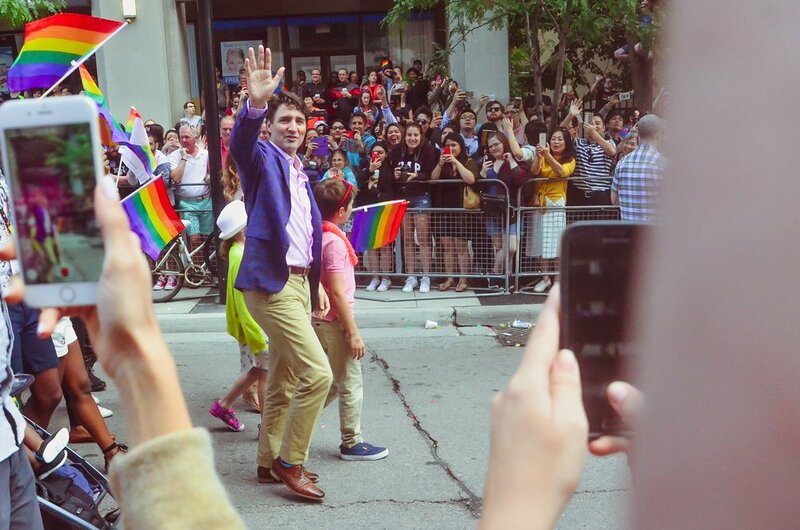 In a heated moment, Trudeau purposefully strode into a group of the official opposition, grabbed one of them by the arm to march him to his seat, and accidentally elbowed a female Member of Parliament in the process. I’m not impressed with Trudeau’s actions. It’s embarrassing by anyone’s standards. No, I wouldn’t go so far to dub it “physical molestation”, but I agree that it was inappropriate, unwarranted, and unrefined. But for me, the act itself wasn’t the most disappointing part of it. It’s what the act represented. It’s how Trudeau presented a contradiction with his behaviour—especially considering his election campaign was essentially designed “to bring sunshine and roses back to Parliament”. His display of arrogance and misuse of power was antithetical to everything he stands for, given the way he proudly calls himself a feminist, actively pursues gender parity and peace, and takes public stands against bullying. How can a person be both? How can someone behave in a way that counters his or her own beliefs—standing for peace and equality one minute, and then doing the exact opposite? Does authenticity make room for inconsistency? Welcome to my world. For years, I’ve been wrestling in this space of confusing contradictions, especially as a full-time justice seeker. It’s a field of “doing good”—and therefore, BEING good. Things start falling apart when we discover that those “good people” in the non-profit world have actions that are antithetical to the mission of the organization. When they pay lip service and wear façades in order to be the person they want the world to see. The public face versus the private face. The idealized self versus the real self. I didn’t expect to find discontinuity and disillusionment in the non-profit sphere. But I did. And it all started when I began my career working for a non-profit that sought to end global labour exploitation—by demanding their own staff to work eighty-hour work weeks for little or no pay. It made no sense. There was a stark contrast between WHAT they wanted to accomplish and HOW they were going to do it. Their actions didn’t line up with their mission. Philanthropists who steal $9 million from their own charity. Aid organizations striving to end poverty while their CEOs earn millions of dollars. Orphanages that abuse and neglect the children in their care. Anti-trafficking agencies who falsify the stories of victims to garner donor support and more of the public spotlight. The political arena has always carried a reputation for having misaligned values and breeding deceitfulness. But why do non-profits—entities designed for social good—cultivate a similar kind of culture? Beginning to understand why non-profit leaders sometimes wear a virtuous veneer starts with a conversation about vulnerability. All of us fear emotional exposure and failure to some degree. We are terrified to be fully and deeply seen. We believe that our duty is to suffer for the sake of the cause in order to gain credibility. We demand nobility of ourselves in order to appear strong and valuable. And so, we see leaders like Jason Russell from Invisible Children having a public breakdown after working himself into a state of exhaustion (and seeing his organization slowly crumble in the aftermath). We see an ordinary person like myself, who was so convinced that perfection was the only way to serve well that I burned myself out as a humanitarian in Southeast Asia while trying to reach an unattainable standard. And yet, working for a greater cause doesn’t always mean we’ll get it right. Because being human inherently means we won’t always get life right. The easiest way to make sense of life is to compartmentalize. To categorize people by placing them in neat little all-encompassing boxes. You’re either good or bad. Liberal or Conservative. Pro-life or pro-choice. A Montreal Canadiens or Toronto Maple Leafs fan. There is no in between. The problem with this way of thinking is that being in the presence of humans means being in the presence of incongruity. By definition, humans are mortal. Finite. Flawed. We’re not robots designed to spout out the same answer or act the same way every time. We’re constantly evolving, constantly learning, constantly changing our minds. And, of course, we’re constantly making mistakes, too. Making a long-term commitment to the non-profit world means getting comfortable with inconsistencies and imperfections—as it is with all aspects of life. Things become problematic when our moments of insincerity or inconsistency become habitual. I’m quite sure Justin Trudeau learned his lesson and will be more in control of his elbows in the future. I think Jason Russell—however inappropriate his behaviour was that day—probably deserves some grace in his public breakdown. As representational figures, they do need to be careful and intentional. But at the end of the day, they remain human, too. I’d always held that Rousseauian belief that all people are basically good. And I still believe that—except that my disillusionment within the non-profit sector (and with life in general) has shown me another aspect of human behavior: that we sometimes live double lives in order to hide our present struggles and past sins. We preach one thing but do the opposite. We have the propensity to do both good and bad. What’s frightening is that if those in the limelight can say one thing but do another, then couldn’t the same thing apply to the people in our lives that we most love and trust? Well … yes. They can. Does that mean we lose faith in humanity? That we don’t bother to trust or love others because they could hurt us? That hope is futile? No. The problem isn’t when we allow the people around us to disappoint us—the problem is when we DON’T leave room for that to happen. 1. WE NEED TO RE-ADJUST OUR EXPECTATIONS OF OTHERS—AND OURSELVES. We set people up for failure when we demand perfectionism or sainthood. Whether they’re a co-worker or the leader of a country, we need to accept the humanity of others at some point—and of ourselves, too. Why? Because we’re human. Perfection was never meant to be the standard. 2. WE NEED TO PRACTICE FORGIVENESS WHEN PEOPLE DON’T PRACTICE WHAT THEY PREACH. Of course, giving others and ourselves permission to be human doesn’t remove us from our responsibilities. It doesn’t give us an excuse to break our promises, compromise our principles, or intentionally hurt other people. We all need to be accountable to our own actions. But we also need to accept that nobody can bear the weight of performing all the time. Even those we love or trust are going to let us down at some point. And when that inevitably happens, we need to find the grace and generosity that we’d want them to extend back to us when we falter, too. 3. WE NEED TO CREATE SPACE FOR VULNERABILITY AND AUTHENTICITY. Hiding our true selves is problematic. Brené Brown shows that when we’re not honest with ourselves or vulnerable with others, then we end up “limit[ing] the fullness of those important experiences that are wrought with uncertainty: love, belonging, trust, joy, and creativity to name a few.” (Read her full interview here). Believe it or not, it’s okay to fail. Engineers Without Borders are a brilliant example, producing an annual failure report to prove that making mistakes can actually be innovative and a source for growth. Freedom begins where perfectionism ends. And that takes authenticity. It requires us to being honest about our brokenness. It’s never easy to reconcile the shadowed side of people that we find in politics and philanthropy, in the work of justice and in our personal lives. But we need to accept that life is more than a series of dichotomies. Fully participating in life means being able to hold two opposing viewpoints at the same time. It means accepting that we all have moments of failing our own virtues. We simply can’t avoid the grey areas. And in those moments where we find ourselves devastated and disillusioned, let’s not forget about the times we DID get things right. Just because the bad is inevitable doesn’t mean that it’s proportionate to all that is good, right, and beautiful in the world.